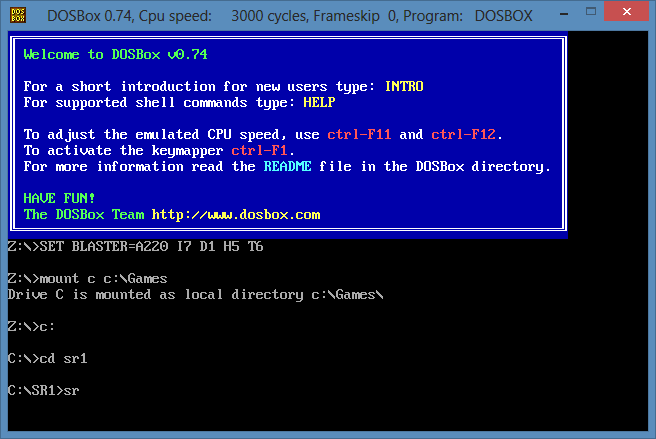 Download DOSBox for Windows here (select “Run” when asked what to do with the file). Select “Yes” when asked whether to allow the program “from an unknown publisher to make changes to this computer”. Click “Next”, “Next” and “Install”. After the program is installed select “Close”. This screenshot is from Windows 8 but the above guide should work for every version of Windows. ← 1963 Ford Futura Falcon on the Car Data Disk? Thanks for making this game available. On windows 8 I dont have a c:\games to unzip the files to, what should I do ? I cannot believe I found this! I am the original artist that created all of the art for this game, pixel by pixel! I worked with the programmers from Poland, this was back in the mid 80’s. In San Jose, California. I still have all the original floppy disks. I went on to work for Accolade and then to Electronic Arts. It’s amazing you found this website and took the time to write a reply. What company did you work for, Logical Design Works or Magic Partners? That last one is somehow related to Street Rod although I can’t find any information about it. I worked for Logical Design Works. (Not familiar with Magic Partners). LDW was the owners initials! it sais, illegal command. what do i do? Really awesome – i love this game…thums up…classic game, brandnew content…you guys rock!!! Can you play this game on an android phone? i just got a phone last week. If so where can i get an emulator for android? it says directory c doesn’t exist. it says Games does not exist. please help. having the same problem! :( did you find a solution? I’ve followed all the prompts but I still cannot get this to load. step ii & iii don’t seem to be correct for me. I had to unzip the file to the desktop then manually move it to the c: drive and then renamed it to “games”. The original name was some thing like mosco_ or something like that. I downloaded the SR2 and the SR1 but you do have to rename them. I named one “games” and the other “games2.” Make sure you use the correct name in the c:\games prompt or c:\games2 like I did. It works fine. I had to unzip the file to the c: drive and then rename it to games. The original name was some thing like mosco_ or something like that. I downloaded the SR2 and the SR1 but you do have to rename them. I names one games and the other games2. Make sure you use the correct name in the c:\games prompt or c:\games like I did. It works fine. How do you make street rod special edition work? This is only working for sr2 how do I get it to play srse? I got it to work on the first try, but is there any way to switch the game to full screen? Hi im brett and I’m from Australia and I absolutely loved street rods 1&2 and I stoked to find out there will soon be a new streetrods 3 coming out can make sure that all 3 versions of this great game are available for Android or iOS and all Apple products like phones & tablets & personal computer’s PLEASE.